The surface area of Hulun Lake, the largest freshwater lake in north China, has expanded over the past five years due to strengthened protection efforts, local authorities said Monday. 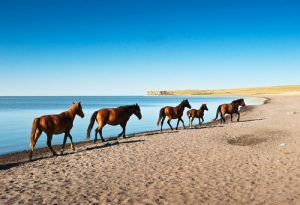 The surface area of the lake in Hulun Buir City, Inner Mongolia Autonomous Region, has reached 2,038 square kilometers, an increase of 288 square kilometers from 2012, data from the regional department of forestry showed. The lake’s water level has also increased by three meters and its wetland area has increased by around 300 square kilometers, the data showed. 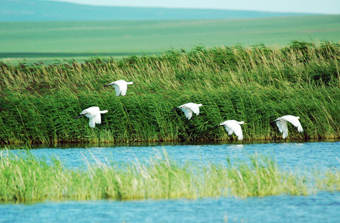 Hulun Lake plays an important role in the ecological security of the grasslands in north China. But years of drought and excessive human activity since 2002 have led to shrinking of the lake and surrounding wetlands and a decline in the wildlife population. To better protect Hulun Lake, Inner Mongolia has intensified a series of measures in recent years, such as diverting water to the lake from nearby rivers, introducing a five-year fishing moratorium to help rehabilitate dwindling aquatic resources, and banning grazing on surrounding grasslands. Six new types of birds have been seen flying over the lake since 2013, including the state-protected white stork and eagle-owl. The lake, located on the Hulun Buir Grassland, is one of the largest freshwater lakes in the country and was included on the list of internationally important wetlands in 2001. News, Translations Grassland, Hulun Lake. permalink. How Old is Your Lover?